A French painter and sculptor whose perceptive analysis of movement made him one of the masters of modern art in the late 19th century. 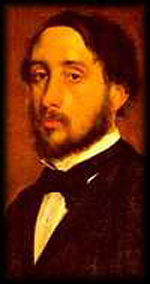 Despite his own desire to paint Edgar Degas began to study law, but broke off his studies in 1853. By 1860 he drawn over 700 copies of other works, mainly early Italian Renaissance and French classical art. He is known as the ballet rehearsal and dancers painter.